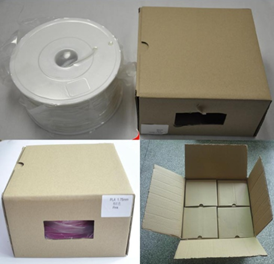 We open the market for our newest product- 3D Printer Filament. Wide range of choice and reasonable price is a guarantee. * All of our raw materials are 100% new materials and certified with RoHS. * The laser diameter runs automatically to control the diameter of the filament and keeps it in a right range of 1.75/3.0mm. Our engineer adjust it immediately when it alarms to indicate of wrong size. The unqualified filament will not be used. * Diameter roundness +/- 0.03mm. * Before mass production, our engineer always does the test to make sure each batch of the new raw materials must be printed by MakerBot or RepRap 3D printer. For all of our filaments, we put the spool in a vaccum PE bag with desiccant. Spool goes to an inner box and finally to the master carton. Water soluble,suitable for printing support part. Coalition of terephthalic acid(TPA), ethylene glycol(EG) and two 1,4-cyclohexane methanol(CHDM). Acid and alkali resistance,can be used widely. Color of printed materials matches color of wood. Limited printing temperature. Higher price. REMARK: Temperature indicated above is just a recommendation. It might vary dependent on specific 3D printer.